Cozy ski-on ski-off trail side Sunrise ski condo overlooking Killington's Bear Mountain is perfect for a great family ski vacation! 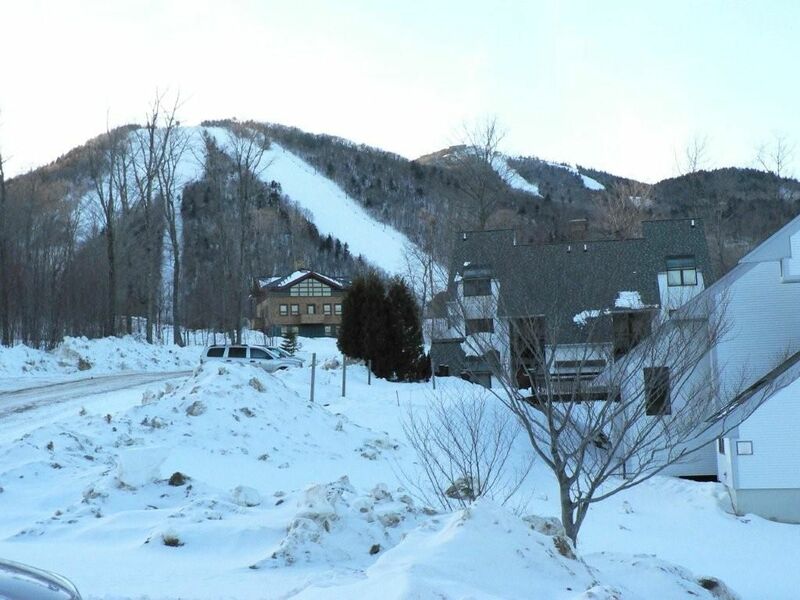 Ski right out your front door, No shuttle bus is needed, use the sunrise chair lift and ski right to the Bear mountain lodge and take the high speed quad (5 minutes to top) to access all of Killington's ski trails and at days end ski right back to the condo. At Killington, you will find some of the most challenging and fun slopes in the northeast. Killington has great restaurants for family fun or fine dining and night life too! This lovely Condo features a large living space with a gorgeous full wall fireplace, Flat screen TV/DVD, High Speed Internet Wi-Fi, fully-equipped kitchen, washer, dryer, and two full baths. Sleeping arrangements include two bedrooms, one with a queen bed and a full private bathroom, the second bedroom has 2 twin bed's also with it's own full bath. The living space also has a sofa bed that can sleep 2 extra people. Each bedroom has a TV/DVD. Great for the kids! Firewood is provided for those cold nights after skiing. along with free parking. The Recreation Center has an indoor pool, hot tub, steam room, sauna, and a fully-equipped fitness center. Free equipment is available for Killington's snowshoe trails and ice skating on Sunrise's own pond. I grew up in NJ my whole life and for a senior class trip (Stockton State) we went skiing to VT and I was hooked on Skiing. As the kids grew up I decided to have some outdoor fun and found Sunrise in Killington as I had stayed there earlier on a previous ski trip and loved it. Skiing has to be one of the best family bonding things that you can possibly have with your family and the condo also happens to be my chill time from work. Love to hike all the trails around the area and also hiking to the top of Outer Limits with the Dog from the condo! At Sunrise Fitness center, with both an Indoor & Outdoor Hot tub, sauna & steam room. Recently stayed here for a long weekend away skiing at Killington. Place worked out great for my wife and I and another couple. Great Location for ski on ski off. The place had everything we needed. Would stay here again for our next trip to Killington. Sweet, clean and super convenient. Comfortable beds! This condo is a great place to stay. The sunrise location has all the amenities with the indoor pool and spa. The convenience of Ski in/out . The unit is comfortable and clean and has everything you need. As Killington condos go this is an awesome place to stay. Highly recommend. Wonderful condo - immaculate and yet had a very homey feel. Very clean unit with all essentials. Our 4 night stay was great in the mountains of Vermont. The condo is very clean, but twin beds are real soft if you are used to firm. Great hot water and washer / dryer very useful. The property was fully stocked with all the conforts of home,spices,dishsoap,trashbags,paper products. Nice cozy sheets and blankets,plenty of towels,even big towels for the outdoor hot tub,which was very nice. Plenty of wood for the fireplace. It was perfect for 5 of us,we put an air mattress in the room with the 2 twin beds. lots of tv options. We did ski in everyday,we skied out 2 days the other day because of warm Temps we just had to walk about 50 yards to the trail,which was so easy also. We skied all over the mountain and had no problems skiing back at the end of the day. I would definitely recommend j3 as a great ,clean place to stay and ski. The owner, Dave was easy to communicate with.